Do you view yourself in the image of your problems or in the image of your Creator? Many people wince when they catch a glimpse of themselves in the mirror. For some, it’s a reaction to physical features with which they have not yet found peace. You know, “this nose,” “those wrinkles,” or “that belly!” But for others, the mirror isn’t merely a reflection of looks, but a reflection of self-image. Revealing much more than what meets the eye, for these people, the mirror is a nagging reminder of past regrets and present struggles. Sadly, it’s not what they see that they hate, but who they see. What about you? 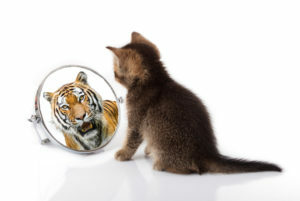 What do you see when you see yourself? Do you view yourself in the image of your problems, be it from yesterday or what you face today? Or do you view yourself in the image of your Creator? This is a crucial question to consider. Of course, how you answer it influences your thoughts about yourself and what you perceive others think about you. But most importantly, it shapes what you believe God thinks about you, which ultimately dictates your destiny. If you don’t accept or forgive yourself, chances are you don’t believe God does, either. And if you don’t believe God accepts you, then you won’t believe He can use you. Do you see the downward spiral of this thinking? If you battle self-image issues or question how God could like you (much less, love you) with all your faults, then keep reading. I want to uncover the mystery of what God sees when He looks at you, which is also the basis of why you’re unconditionally loved and totally useable by Him today. Let’s begin in the beginning. After creation’s conception, God spoke to His newly birthed earth to bring about every kind of plant and animal. “Let the land sprout with vegetation,” He instructed (Gen. 1:11). “Let the earth produce every sort of animal,” He added (Genesis 1:24). The results were all good, the Lord observed. But something far better was yet to happen. The contrast between the creation of plants and animals and the creation of people is stark. So that you don’t miss the significance, allow me to highlight it once more. According to Scripture, everything seen inside of creation reflects creation (brought forth from land), but only humankind reflects God Himself. The first is good; the latter is very good. Many attempt to explain what God intends, some suggesting God’s likeness is evidenced in humankind’s original righteousness (the perfection in which we were created before sin). Others believe the answer lies in our ability to reason and discern right from wrong. These explanations may all be true in part. But consider what an image is meant to do. An image is created to be a representation or an expression of something. Simply put: God created us as reflections of Himself, so that when others see our lives, they might know something about Him. Creation is stacked full of evidence that argue for God’s existence. “The skies display His craftsmanship,” David exclaimed (Psalm 19:1). The sea of stars, the endless galaxies, they all point to His hands. But you and I—people made in His image—were intended to do far more than show His hands. We were crafted to reflect His heart. With more than seven billion people, this earth is filled with more than seven billion potential expressions of God’s goodness, love, faithfulness, and forgiveness—if only we choose to display them. If only we choose to see them. Did Sin Destroy God’s Image? While it’s true the stain of the original sin defaced the likeness of God in us (and continues to do so), it didn’t destroy or even devalue it. That would be giving sin too much power. As demonstrated immediately after Adam and Eve’s fall, the result of shame is to hide, often from yourself and others, but most detrimentally, from God. Of course, this is futile. God sees everything, anyway. Still, shame is crafty at influencing you to believe He won’t accept you because of what He sees. Thus, the temptation to hide. Yet, like x-ray vision, the eyes of your Creator penetrate beneath the layers of pain and shame to see Himself. God loves Himself. And because He sees Himself in you, He deeply and unconditionally loves you, too. Though God has an unparalleled ability to see beyond layers of dirtiness that you and others can’t, He’s not satisfied with His image remaining covered by muck and mire. Remember, an image is meant to be a representation, and God wants to bring His reflection in you to the surface so that others may see Him, too. What’s God’s grand solution to achieve this? It’s Jesus. Simply and beautifully, Jesus. Jesus is the fullness of God in the flesh (See Colossians 2:9). His death and resurrection provided the spiritual restoration of all that was sacrificed because of sin: relationship with God, eternal life and God’s undistorted image. The Bible assures, “all who have been united with Christ in baptism have put on Christ, like putting on new clothes.” (Galatians 3:27) Yes, salvation clothes the believer in Jesus—God’s perfect image. When God sees one who is in Christ, He no longer has to peer in beyond layers of sin to see a speck of Himself. No, those layers are spiritually removed and replaced with the fullness of who He is, so that when God sees you, He sees Jesus. Nothing but Jesus. Resultantly, He declares you His masterpiece, created anew in Christ Jesus to do the good things He planned long ago (See Ephesians 2:10). There’s no greater self-image than to see yourself in His image. Next time you glance in the mirror, look with the eyes of God to see beyond the surface—to see His face in you. And every time the lie that you’re unworthy, unacceptable, or unforgivable intrudes your thoughts, remember God loves you, and He has a plan to use you despite everything that seems unusable or unlovable about you.